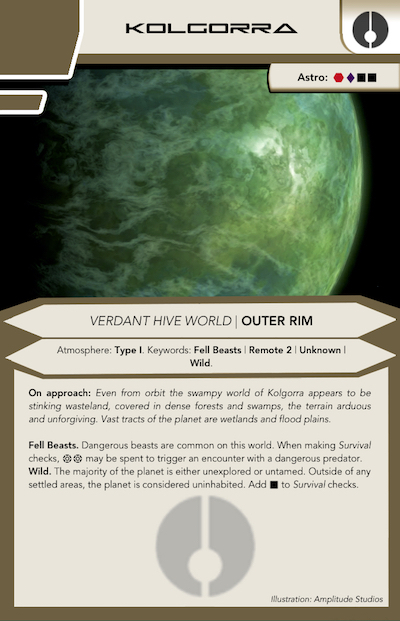 The swampy world of Kolgorra is a stinking wasteland, unexplored and uninhabited, in the depths of the Outer Rim. Covered in dense forests and swamps, Kolgorra's terrain is arduous and unforgiving; what mountainous regions exist are similarly harsh and sheer. Most of its surface is covered in lowland bogs and marshes. While it has no seas or oceans, vast tracts of the planet are essentially wetlands and flood plains. Kolgorra is on the Outer Rim.